We are installing a 5hp cyclone dust collector, with a noise level of about 95db, in a small woodworking shop in a retirement community. We need to get the noise level down to under 80db if possible. We have very limited space so enclosing the whole system is not practical. It has been shown by others that most of the noise comes from the output port of a cyclone. The fundamental frequency of the noise, which is caused by the blades of the impeller in the cyclone compressing the air against the side of the blower sidewall, is about 300Hz. The output air goes through a 1/2 micron filter which has outside dimensions of 13" OD and 72" long. The air enters an 8" duct in the center of the filter and passes from inside to outside through the filter material. Our plan is to build an noise abatement filter around the filter. This will be followed by a muffler/silencer with a noise loss (DIL) of about 20db to 30db in the frequency range of interest. Question: How do we design the filter enclosure? Our present design consists of a 24" x 24" x 84" box around the filter. The box would be made with a sandwich of 3/4" MDF, 1/2" soundboard and a 2" of layer of mat-faced duct liner ( density of 24 kg/m3). It has been suggested that we should put heavy roofing felt between the MDF and and soundboard. 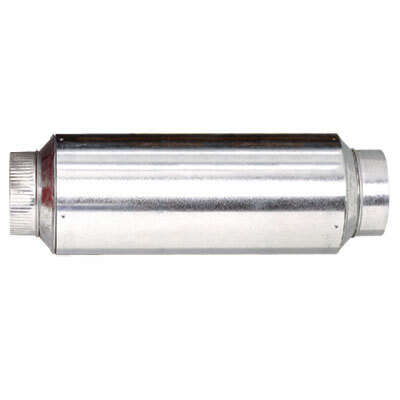 We think that the combination of the filter enclosure and the muffler will be effective in attenuating the noise coming out the end of the muffler. Our major concern is the noise coming out the sidewalls of the filter enclosure. We would be very interested in comments of how well this filter enclosure might work and how the design could be improved. - Is soundboard the right choice? - What is the best choice for the duct liner material to minimize the noise coming out the sides? - What is the best strategy for fastening the layers? For example, should we glue the felt to the MDF and the soundboard to the felt? Could you post a drawing of the whole? And add dimensions in cm? If I have a clear view of your problem I'll be glad to try to help. VermontDale wrote: - Other suggestions? Would one of these things help? Hi Bert: Thanks for the offer of support. I am attaching two drawings of two views of the current design. I hope the are understandable. Any suggestions would be greatly appreciated. Hi Bob: Thanks for the link to the Penn State muffler. It does sound like a very interesting product. However, the spec doesn't show the db of attenuation versus frequency. In particular, attenuating the lower frequencies, less than 1000 Hz, are more difficult to achieve. The 10 db may be for high frequencies. Also, I note that one of the reviews complained about a high level of dust leakage from the joints at the ends of the muffler. Perhaps, he got a bad muffler and his is not typical. Do you have more information on this muffler? Are there other similar products? Is there a structure borne component to the LF noise - if so mechanical decoupling of the unit and its filter from the wall/floor may help - there may be standard anti-vibration mounting components that would help. Also can the entire filter assembly be moved outside or to a sealed closet via ducting? Also could a vfd motor speed controller be used to slow the operating fan speed down a few notches without going below filter efficacy limits? The noise frequency will change but so will amplitude I reckon. Hi Scott: Thanks for the suggestions. The impeller in the cyclone is balanced for 3750 RPM so changing the speed it is not an option. In fact, running at 50Hz rather than 60Hz can cause problems. We plan to hang the cyclone and the filter enclosure on sound acoustic hangers.The ones you provided are interesting. The spectrum of the noise is very broad. The fundamental is just over 300Hz and extends out to at least 3000Hz with lots of peaks from what I have read. So, a simplle resonator probably wouldn't help much. In fact, the cyclone has a sort or resonator. The noise is caused by the air being compressed each time a blade passes by the the closest spacing to the enclosure wall. They mount a piece of wood about 3/4" on a side on the opposite side of blower wall spaced precisely to generate a sound wave which tends to cancel out the original noise. They claim this to reduces the net noise by 10db. I would take 2 layers of 18 mm MDF with Green Glue in between. We used a 2 x 18mm MDF sandwich with GG for a testing room in a factory. Here speakers are tested on very high soundlevels for frequencies above 130 HZ. It should reduce the noise about 25 dB in the 250 octave band, and like 28 in the 500 band. If you need more you have to work with a double leaf construction. Hi Bert: Thanks for the reply. I was looking for exactly this sort of technical advice! Sound board is basically a softer version of Homasote with little structural strength from what I know. 1. Do you recommend using duct liner? It would help reduce the reflected noises inside the structure and would reduce the noise going into the muffler. 2. How do you mount the inside piece of MDF to the outside piece? The Green Glue people say that the Green Glue is not enough to hold it in place. The panels would be about 60cm x 240cm. 3. Some have suggested using heavy roofing felt (tar paper) glued in place instead of Green Glue. Does this really work? 4. Do you have advice as to how to treat the edges of the MDF? Should we leave gaps and fill them with some sort of acoustic chalk? Is common chalking such as used for construction OK? Yes, you have to use duct liner. You can screw the MDF together, don't use to many screws. I would not screw the middle but the perimeter. If you decide to use a double leaf system you can decouple the boxes using the Agglomer. As far as I know roofing felt is inferior to GG. I would just build a box and join the edges. What formula do they use to prove that -50 % equals -10 dB? Hi Bert: Thanks for the answers to my questions. I am getting close to finalizing the design. I have one more question. I have read that you should use different materials on the two layers since it each will have different resonant frequencies. For example, one could use gypsum board on MDF. Does this make much difference? It's the weight of the combined materials that does the fundamental isolating trick and these two combined materials don't have two resonances but a new single resonance frequency. So a 12.5 mm gypsum board combined with a 15 or 18 mm MDF board doubles the weigth of one of the panels alone. MDF will be slightly stiffer than gypsum, but I don't think you're going to notice this. Mass is starting to isolate somewhat above it's materials resonance frequency. Under that frequency you can even get amplification because of resonance. The Green Glue between the layers of MDF, gypsum of the combination works as a constrayned layer damper; a material like glass, MDF etc has a frequency region where bending waves are moving along the surface of the material. These waves don't have, as normal soundwaves in air, a fixed velocity. When the velocity of the wave in the material equals that of the speed of sound in air, you get resonance. This so called coincidence frequency generates a dip in the sound isolation. GG damps this effect (as does PVB foil between window planes, etc.). GG does this very effective. So mass is isolating from the resonance frequency up, and a CLD (impedance jump) does this for the higher coincidence dip. Using for example MDF, a layer of softboard, and MDF to improve isolation is a bit of urban myth and will not yield substantial better isolation than the same weight of MDF or chipboard etc. Use this to filter noise acoustic enclosure. It is made up of high performance acoustical fencing that is used to reduce airborne noise energy in many industrial and architectural applications. With velcro, each two pieces can be tightly collected. I think using noise absorbing curtains will be very good for you. It will protect you from noise pollution. Or you can use acoustic curtains that play an important role in absorbing sound. The house that I live in, at the side of the street, all the noise from the outside enter the house. I use a noise barrier but I do not know what is its advantage and what is the problem? So if someone knows me, I'll tell you about the noise barrier.